Union Sword Belts for sale fit waist size 37 to 42 inch and can be adjusted for smaller waists by punching holes into the leather. 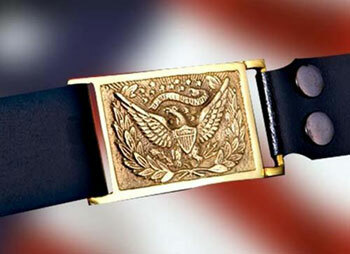 Union Sword Belts are made of real leather and feature an intricate relief of an eagle along with the E Pluribus Unum banner on the square, genuine brass buckle. They have two straps that can be attached to the rings on the scabbard of a saber. These sword belts are made to carry all types of popular military swords, sabers and their scabbards. Buy the Union Sword Belts for only $89.99.